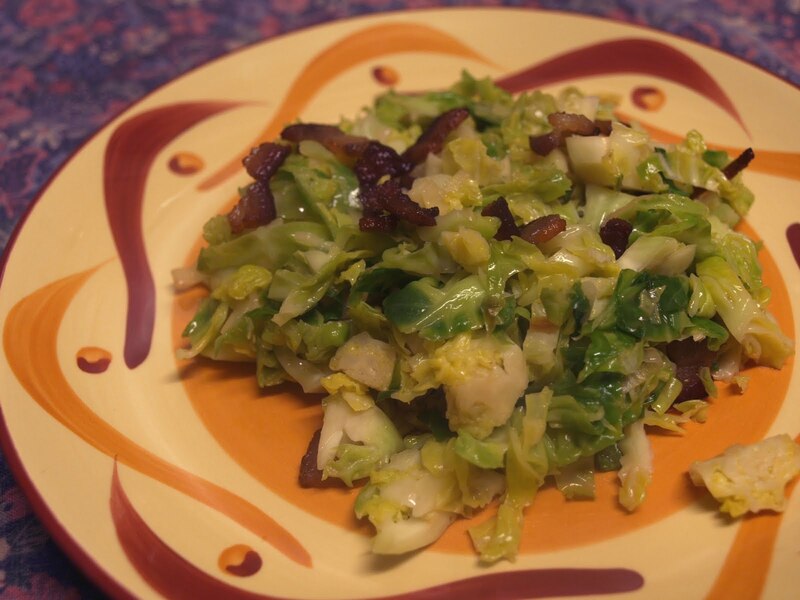 This dish is for those who aren't as wild about brussels sprouts. By shredding them and adding other strongly flavored ingredients, such as bacon and lemon juice, the strong flavor that these little veggies can have is toned down a bit. Of course, if you really love their flavor, you can let it shine through! Chop the raw bacon into small pieces and put them in a shallow pan on medium heat. Stir them frequently so they cook evenly. Prepare the brussels sprouts while the bacon cooks down and becomes crispy. When it does, remove the bacon into a dish and set aside. Leave the drippings in the pan! Rinse the brussels sprouts and remove any tattered outer leaves, and cut off the stems. To shred them, cut them in half from pole to pole, then make thin slices from top to bottom. Don't worry if oyu don't have exactly 2 cups- the recipe can be flexible. Add the leek to the hot bacon drippings and let cook for several minutes. Add the shredded brussels sprouts and stir. Cook over medium heat for about 10 minutes, until the brussels sprouts become bright green and soften. Try a little to see if it's done. Remove from heat, slat to taste, and add a dash of either lemon juice or vinegar. Add the bacon pieces back in or serve them on the side. At this point you can add any of the optional ingredients if you'd like. Linked to you. We love this recipe!! If the way I shared it is unacceptable, please do let me know and I will remove it. What a great blog, and thanks for sharing our recipe! I hope your dietary changes help!